Wedding floral centerpieces are the most popular type of centerpiece. They are colorful and can really make a statement regardless of the season you are getting married. From simple to extravagant, using flowers in your centerpieces can turn an average wedding into something special. As with many parts of planning a wedding, it can take time and hard work to find the perfect combination of flowers, containers and accent items for your wedding reception tables. The flowers you choose for your centerpieces will depend on a few factors. You will want to match the color and style you choose to your wedding reception space as well as your wedding colors and other reception decorations. The season that you are getting married can also impact what flowers are easily available, and if you are using a wedding theme you will want to make sure the flowers you select fit in nicely. To help you with the sometimes difficult decision about what flowers to include in your centerpieces, visit wedding flower idea. There you will find ideas for seasonal flowers as well as flowers to match your wedding colors. There are many different types of containers that can be used for wedding floral centerpieces. Traditional vases can be used, but you can also look for unique shapes and containers for something different. Hurricane vases work really well, and other containers like fish bowls, birdcages and bottles can be a lot of fun. Try matching your container with your wedding theme, and don't be afraid to get creative. A newer trend in wedding receptions is family style wedding tables. This allows you the option to choose rectangular or square containers to hold your flowers instead of the usual round vases. Try filling the vases with items like pearls, stones or colored water to add some flair, and ribbons can also be tied around your containers. Flowers can definitely stand on their own, but sometimes it is nice to combine flowers with other accent items. This works especially well for seasonal wedding centerpieces. For example, if you are having a fall wedding try using pumpkins along with flowers. For a winter or Christmas wedding, adding ornaments or pine cones works really well. Candles are another great accent item that helps to set the mood at your wedding reception. Used correctly in your centerpieces, candles and flowers can make a stunning combination. 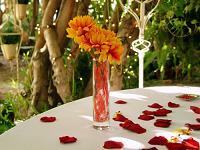 You can also sprinkle flower petals on your reception tables around the vases or containers. 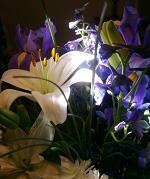 Working with a qualified, experienced florist can save you a lot of time and money. They are great resources to bounce ideas off of, and they can help make suggestions based on your desires, wedding theme and season. 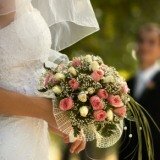 When choosing a florist, make sure they are experienced with weddings, and always ask for references. 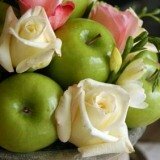 It may be tempting for some to try to do it yourself, but you may want to alleviate stress and long nights by using a good florist.